About > Blog > The endangered ‘Fishing Cats’ have arrived at Hoo Farm! The endangered ‘Fishing Cats’ have arrived at Hoo Farm! May looks to be a particularly exciting month. Our BRAND NEW Fishing Cats have arrived and are happily settled into their new enclosure. This endangered species, found throughout Asia, are stunning animals and one we’ve admired for years. They are now on display and ready to everyone to come and meet them. The Parrots of the Caribbean area is also up and running: come enjoy a cup of tea whilst watching our feathered friends and listening to some jaunty tunes. Yarrrr. Our Fishing Cats need names! We are offering one lucky winner the chance to win a free day out with their family* at Hoo Farm. Just reply to this email with your naming ideas for our boy/girl pair – we will be picking the best on 31st May. *Family ticket is 5 people. This month has seen the arrival of our 2 Fishing Cats, as well as delivery of 2 electric QuadBikes for our younger guests to enjoy. Our weekly ‘Mums and Tots’ group is getting into full swing. On 8 Superhero Day, with the Real Rocket Raccoon visiting. 30th May sees Ascot at Hoo Farm, with sheep shearing and spinning demonstrations. 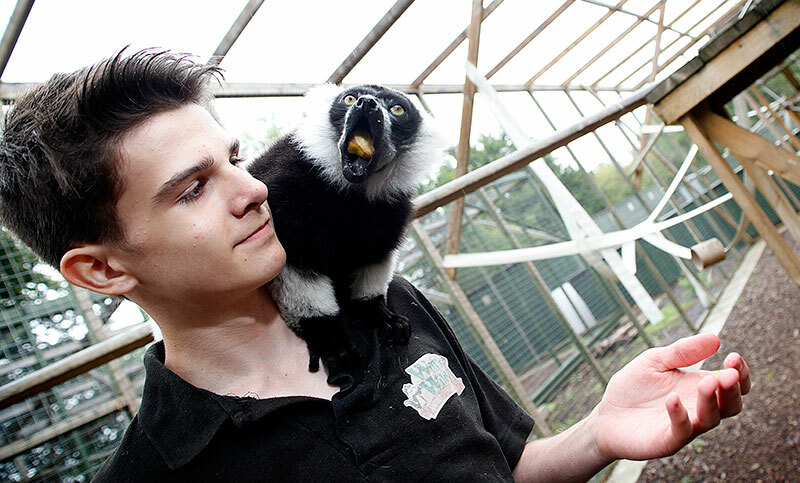 Jono is one of our Animal Care and Encounters team. He is currently completing a qualification in Animal Management and can often be found leading one of our many experience days.